Growing up, Krista was my best friend. We spent so much time together during our junior high and high school years that our parents joked about trading adoption papers so we'd both officially belong in both families. I called her mother "Mom" almost as easily as I did my own mother. Like most teenage girls, I spent a lot of time trying to figure out how to be beautiful. I wasn't exactly sure how to become beautiful , but it seemed to require lots of time spent on my hair, the right makeup and plenty of new clothes. Krista's mother Anne didn't follow that philosophy, yet still managed to be one of the most beautiful women I have ever known. Anne's hair was simple, I don't think I ever saw her with makeup on and she often wore jeans and a T-shirt. Yet she was beautiful. I imagine she still is, though I haven't seen her in a long time. People will sometimes say, "She's beautiful, inside and out." Well, that was certainly the case with Anne, and my teenage self recognized it without fully understanding why. Looking back, I see that she smiled easily. She was genuinely happy to see people when they were visiting. She was kind and gentle and, well, you get the idea! 1 Peter 3:3,4 says, "Your beauty should not come from outward adornment, such as elaborate hairstyles and the wearing of gold jewelry or fine clothes. Rather, it should be that of your inner self, the unfading beauty of a gentle and quiet spirit, which is of great worth in God’s sight." Over the years many denominations, including my own, have used this verse (and others like it) to say that women shouldn't wear makeup, or earrings, or pants, or any number of other things they felt were somehow ungodly. But that's not what it means. It's not that there's anything wrong with those things. It's more that, if that's the only beauty you have, then you are a very ugly person indeed! In the book of Colossians, Paul tells us what all Christians should put on, and it has nothing to do with our appearance. "Therefore, as God’s chosen people, holy and dearly loved, clothe yourselves with compassion, kindness, humility, gentleness and patience. Bear with each other and forgive one another if any of you has a grievance against someone. Forgive as the Lord forgave you. And over all these virtues put on love, which binds them all together in perfect unity" (Colossians 3:12-14). Compassion. Kindness. Humility. Gentleness. Patience. Forgiveness. Love. Do we put those things on daily, as diligently as we put on the clothes that make us feel pretty? Or as carefully as we style our hair? 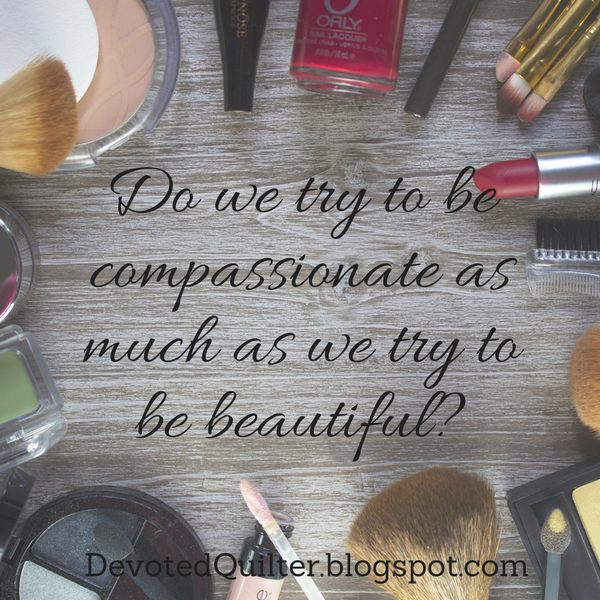 Do we try to be compassionate and humble as much as we try to be beautiful? Many of us would be horrified to be seen in public the way we look when we get out of bed. Are we equally horrified to be seen being unkind or impatient? Maybe that's something to think about in the mornings this week as we get ourselves ready to be seen in public.